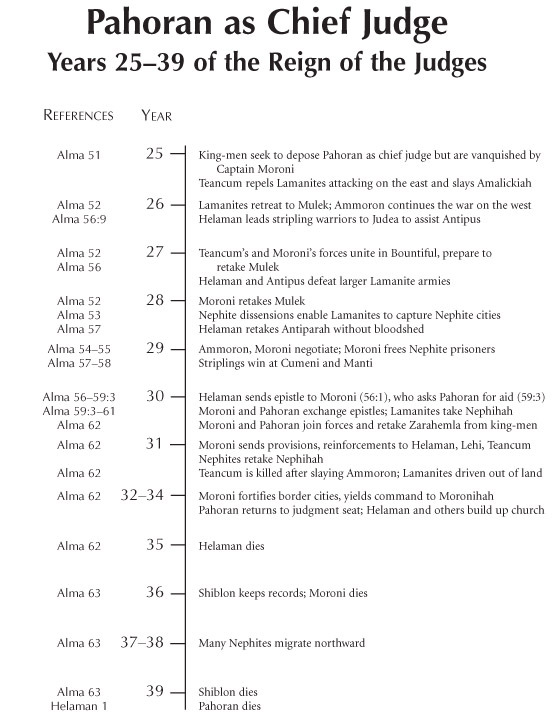 War ravaged half of the very eventful fifteen years during which Pahoran served as chief judge (67–53 B.C.). He tried, often unsuccessfully, to hold the Nephite capital together. With wars dragging on for seven years in the north and to the south, Pahoran was unable to effectively administer justice and preserve unity among the people. He was plagued with rebellions at home and held several king-men in prison for the duration of the conflict. After the war, governmental offices and church functions were reestablished and the Nephites began to prosper. Within a short time of each other, however, four very influential Nephite leaders, including Pahoran, all died, leaving the Nephites very weak on leadership.